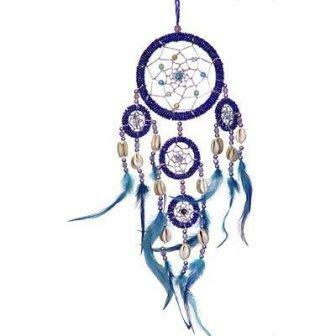 This beautiful dream catcher rings have been made with iridescent blue beads. Adding extra color and movement to the web are tiny shells and turquoise feathers which hang from each of the four smaller webs. Measures about 17" long. This beautiful dream catcher's rings have been made with iridescent pink beads. Adding extra color and movement to the web are tiny shells and purple feathers which hang from each of the four smaller webs. I bought this dreamcatcher for my girlfriend, and she absolutely loved it. Great color and great details.